Anyone seeing recovery in there area? The Corona area in southern california as far as homes go, there are no more deals below 260K unless in a questionable area, spoke to a realtor friend and she said the inventory is way down . .... just wondering if anyone is seeing this in other areas? Kind of hard to believe unemployment is still high here in the inland empire?! Makes me wonder where the buyers are getting the money for these houses. I thought even those with a job were having more trouble getting a mortgage these days. No, sales volume is still down in New Orleans, apparently. Deep south here. Prices are stable. But sales have picked up recently. It's been a while since I have seen so many "sold" signs. Just another costly to the taxpayers example of the government's desperate attempts to pull demand forward, artificially propping up prices. No doubt others will disagree. I actually funded a loan today for someone I have never met... set up by a realtor friend. Loaned 30K on a 60K transaction- the buyer has 50% skin in the game. 10% interest, no prepayment, 2 year balloon. Property is a outstanding view lot in an upscale subdivision that sold for 300K in 2006. There are creative financing options available. This is my second deal like this, the first was on a large piece of investment property I sold last year. I'm carrying the contract on that one, too. 15 years at 6.5%, 20% down payment, so far no issues- the buyer has it set up on autopay. Never thought I'd be in the mortgage business, but the return has been great so far...might try a couple more, it beats the heck out of 1% or less in a MM account. I still have a couple of other properties I'd like to sell, offering to carry the contracts might make it easier than trying to find all-cash buyers. There is opportunity out there in the current mortgage climate; just not in doing business as usual. We are watching the Austin real estate market closely since our apartment is being sold. 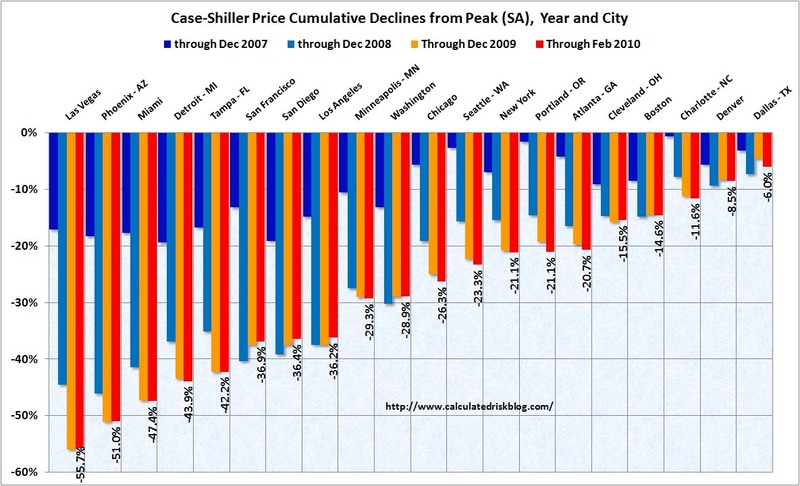 Unfortunately for us, Austin's market only dipped a little and prices remain pretty high. Me and my siblings own a condo in the southern minnesota area and I could only wish there was some action like this back there, we cant give that thing away! but its a little more of a selective buyer 55+ buts its a nice one bedroom condo, been on the market 2 years. interesting hearing the differences in areas......... I know Austin Tx is strong, know of a few friends that want to move there and they have said that its kinda tough finding something. We just listed our house on the market near Houston. It is listed for more than we paid for it 3 1/2 years ago, but then we have made upgrades to it so I don't see it as having increased in value so much as stayed the same. I would say the area where we are is a mild seller's market. I have a good feeling for the Tampa area. We are in the Sun City retirement community and things here are holding steady. I think prices have bottomed out. We bought and closed on 12-30-09. Got in on the first time home buyer credit. Paid just under $100/sq ft for a 2050 sq ft on the best golf course in the community (there are seven courses here). I look at the closings in the newspaper every Sunday and have a feeling that things are just steady. Another year will make a big difference.